Alan Ruck, Mia Sara, and Matthew Broderick in Ferris Bueller’s Day Off. Ferris Bueller’s Day Off is a somewhat enjoyable way to pass 102 minutes, with no strenuous thought on the viewer’s part. Matthew Broderick plays the title character, a high school student who has orchestrated a complex scheme to get out of school. It’s his ninth time of the semester, and thus rousing the suspicion of the dean of students, Ed Rooney (JEFFREY JONES), who decides to take matters into his own hands, while meanwhile, Ferris and two of his friends, Cameron and Sloane, played by Alan Ruck and Mia Sara, respectively, are spending the day bouncing all around the city of Chicago. Hughes’ film uses a kind of meta technique, characterized in Ferris directly addressing the audience with little bursts of dialogue (asides) that less inventive filmmakers would use in a voice over. It would have been astoundingly easy to completely overdo it and make the film come off as entirely self-righteous and referential, but is done to an extent where annoyance is kept to as much minimum as possible. The script overall is well paced, and the characters have enough depth where we have at least minimal reason to care about them. But there is a significant and notable problem with the main character. If we think closely about the character and his motives, there really is nothing exceedingly likable about him – he goes to great lengths to involve people in a plan they are initially reluctant to become involved in (or at least Cameron’s case), and they only come around to his side with a salesman-like coaxing. To get Sloane out of class, Ferris and the now on board Cameron create an elaborate scheme that Sloane’s grandmother has died. The main character is only saved from coming off as punch-in-the-face-smug is Broderick’s performance, which through some twist of fate, works. Also in the movie there is Jennifer Grey as Ferris’ sister, who seeks to expose his endeavors to his oblivious parents, who are played by Lyman Ward and Cindy Pickett. Also, Charlie Sheen has a brief appearance as a red-eyed guy in the police station. Very suspiciously foreshadow-y. 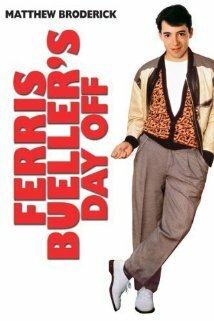 As a whole, Ferris Bueller’s Day Off has no destructively bad qualities, but it certainly has flaws that are difficult to excuse. That’s not to say there aren’t certainly impressive sequences, such as Ed Rooney’s slapstick-esque trek around the Bueller residence, in a similar vein to a Hughes film that would come out three years later, Home Alone. It is an undeniably significant piece of 1980s cinema, especially in the teen oriented subgenre of comedy, and that concrete impact on culture and filmmaking is the reason why I still feel alright recommending this one.